ORLANDO, Florida -- Jalen Adams banked in a 3-pointer from beyond half court at the buzzer to send the game into a fourth overtime, and Connecticut went on to surprise Cincinnati 104-97 on Friday in the quarterfinals of the American Athletic Conference Tournament. The Huskies (22-10) moved into the semifinals against Temple. Cincinnati fell to 22-10, but still has a shot to get into the NCAA Tournament. "That was amazing," Adams said. "That was the best game, and the longest game." After the Bearcats went up 88-85 with .8 seconds left in the third OT, the Huskies inbounded the ball, Adams took a few steps and launched the ball from about 60 feet. The ball banked into the basket and the Huskies celebrated the miracle shot. Officials reviewed the call, and ruled the shot was taken before the horn sounded. "I've got to get a shot off," Adams said of his thoughts when he had the ball in his hands. "If it goes in, it would be amazing, and if we lost at least we would go out fighting." It went in. And Cincinnati was stunned. 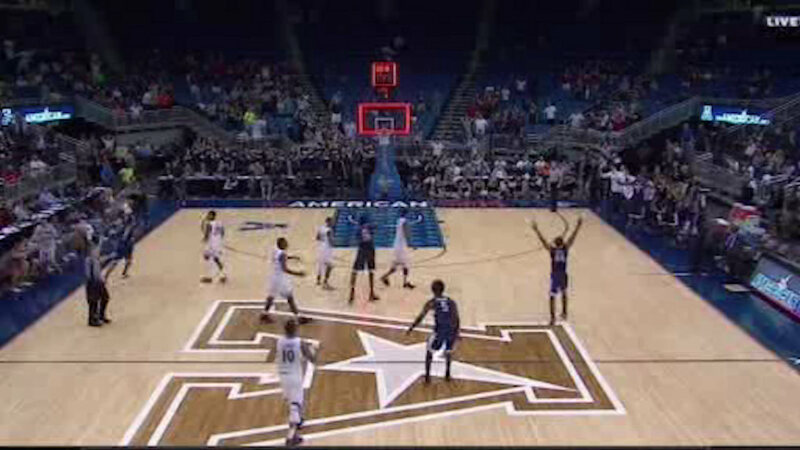 In the fourth OT, UConn hit a bunch of free throws late win the final minutes to the seal the win. Adams finished with 24 points, with Daniel Hamilton leading the Huskies with 32 points. Kevin Johnson's 3-pointer in the third OT gave the Bearcats what they thought were the points. Troy Caupin led Cincinnati with 37 points.